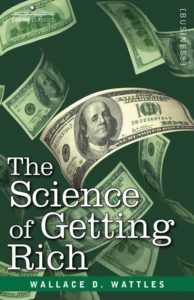 For indie filmmakers seeking film funding, the fantastic book The Science of Getting Rich contains advice on a fantastic tool that is often overlooked and underused. The power of your mind to manifest success. Before the film “The Secret” or before the book “Think and Grow Rich”, there was author Wallace D. Wattles. He was a serious man who wrote the Science of Getting Rich and other important books about using the power of your mind. He realized its power in the early 1900’s. In my newest video blog, and in subsequent videos to follow, I will share the amazing information gleaned from his book with you. His groundbreaking discoveries can be used today to enrich your life, bring you success, and if you are a filmmaker, it will help you realize your full creative potential. Wallace D. Wattles says that to fully make use of your creative powers you need to be rich. With money…… you can use your creativity for your art and your family. The object of all life is development and to be developed you need money. He thinks every man and woman should have money to unfold their soul and develop talent. Wallace contends our right to life means our right to have free and unrestricted use of all things necessary to our fullest unfoldment of our right to be rich. Everyone should have that which can contribute to the power, elegance and richness of life. It is perfectly right that you should desire to be rich so you should give your best attention to these teachings. Certain laws, Wallace determined, govern the process of acquiring riches and, when they are learned and obeyed, you will get rich. No matter how poor you may be, if you begin to do things in the Certain Way, you will begin to get rich and you will begin to have capital. He wants us to understand that everything you see on earth is made from one original substance which he also calls the formless substance. The original substance is a powerful energy that we’ve yet to truly harness or master. Wallace says there is no limit to the supply of this “original substance.” The universe is made from it, the spaces in and between the forms of the visible universe are permeated with it, and the universe is filled with the original substance. We know today that quantum physics says this is true. It says that if we are sitting 3 feet apart the energy between us is enough to boil all the oceans on earth. So, Wallace was right. And he believed the resources of the Original substance are at the command of every man or woman who will act and think in a certain way. Wallace says you need to use his ideas as if they were proven because they are. He believes you can prove their truth by acting on a set of principles that he has outlined. The first principle in the science of getting rich is to understand that thought is the only power which can produce tangible riches from the Original or Formless Substance. A thought of form, your imagination for example, produces the physical form. We live in a thought world which is part of a thought universe. No thought of form can be impressed on original substance without causing the creation of the physical form. We are a thinking center and we can originate thought. All the physical forms we fashion with our hands must first exist in our thought; we cannot shape a thing until we have thought that thing. Thought in thinking substance, produces shapes. We can communicate our thought to original thinking substance and we can cause the creation or formation of the thing we think about. We can form things in our thought, and by impressing our thought upon formless substance, can cause the thing we thinks about to be created. To do this, you need to acquire the ability to think the certain way; this is the first step toward getting rich. We will cover this first step in part 2. This entry was posted in Uncategorized and tagged Carole Dean, film funding, manifesting, mind power, wallace d. wattles by Richard Kaufman. Bookmark the permalink.